Chia Fresh Fruit Pudding - Chia seeds are very high in fiber 1 ounce of chia seeds contains 11 grams of fiber. This is incredible considering we are talking about 1 ounce . Chia seeds arengluten free and full of antioxidants. In a large bowl combine all ingredients except the fruit; mix well make sure all ingredients are thoroughly combined. Cover bowl with ceran-wrap (plastic wrap) and place in the the refrigerator over night. 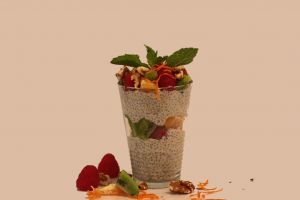 In the morning grab 8oz glasses and pour the chia mixture to cover ⅓ of each glass add fresh fruit and add another level of chia mixture then top it off with some more fresh fruit and walnuts.